With the Hexagonal Rollerball Pen, another quality Derofe Fine Writing Instrument is born and presented in a stylish black gift box. 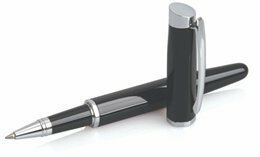 The German quality rollerball delivers black ink in a style appropriate to the elegant black finish with chrome trim. Comes laser engraved with your client's logo or name on the barrel to create a personalised gift of integrity, style and quality.